TRIKALA, THE IDEAL DESTINATION FOR INCENTIVES, CONFERENCES, CONGRESSES, MEETINGS, BUSINESS TRAVEL,INTERNATIONAL CULTURAL AND SPORT EVENTS. Welcome to Trikala, one of the most visited areas of Thessaly and a world known destination for religious tourism along with ecotourism. 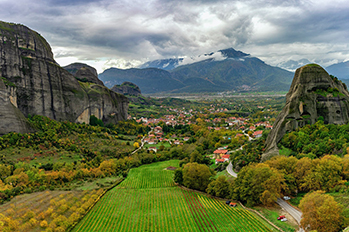 The prefecture of Trikala is a beautiful area, harmoniously combining the joys of mountains and evergreen plains. Mountains, rivers, caves, canyons and hiking trails are an ideal platform for nature lovers and outdoor activists, who also get the chance to admire the marvellous landscapes. Some archaeological sites, museums and above all monasteries and churches situated at the most astonishing spots around the world; wait for the visitors to explore. Visit the UNESCO's ''World Heritage'' site of Meteora with the stunning vertical rocks that appear as though they are hanging from the sky. Climb up to the Byzantine monasteries, elaborately built on their tops, in order to enjoy a natural world wonder, with breathtaking views to leave no visitor untouched. Stop over at the capital town of Trikala, a wonderful town crossed by a river, where the heart of the prefecture beats. Combining with the hospitality of the locals, the unique infrastructure in Trikala attracts thousands of tourists throughout the mountainous areas of Pindos (Elati, Pertouli, Neraeidohori), which serve as ideal ecotourism destinations. Tranquil hamlets are strewn throughout the region, giving the impression that time has stood still there. Several luxury and traditional hotels can be found at the most popular destinations of the area to please every visitor. Thousands of visitors enjoy year-round vacations at comfortable hospitality settlements, tasting local delicacies, where tradition has been kept alive through a multitude of open-air festivities. The area is also a must destination for religious tourists who get the chance to experience on of the most spiritual journeys ever. The prefecture of Trikala, situated at the heart of the Greek mainland, can be accesses by road or train. The national bus services offer daily routes from the cities of Athens and Thessaloniki to reach every part of the region, while car rental is a perfect choice for those who wish to explore the hidden beauties of the region. On the other hand, railway services are a safe and fast mean of transport to also give the opportunity to get a good picture of untouched nature. 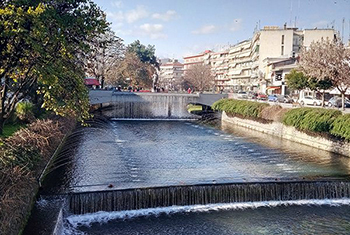 The capital of the prefecture is Trikala Town, which despite having modern features, retains a traditional atmosphere referring to its historical past. The stone paved main streets at the town centre and the wonderful squares at the banks of the river Litheos, a tributary of Pinios river is the lively part of the town. Asklipios foot-walk and ''Manavika'' region are the ideal places for great food and entertainment. Trikala feature several neighbourhoods with traditional neoclassic building or others with Thessalian architecture elements, along with a castle, museums, a Muslim mosque operating as a museum, an impressive art centre roofed under an old industrial building and several Byzantine churches. The city of Kalambaka is another popular destination as it lies on the feet of Meteora, to offer all the necessary facilities to accommodate the visitors of this magnificent site, while featuring folkloric museums, caves, etc Pertouli is another popular destination, especially for skiers as it is located next to the skiing centre. This traditional settlement features stone-built houses with stone or tiled roofs, and most of all one of the prettiest fir forests in the country, while locals despite the touristic development of the area maintain morals alive by organizing cultural events and traditional feasts all year around. The amphitheatrically built traditional village of Elati is another must see destination, also supported with plenty of tourist infrastructures. Dense vegetation and a fir forest surround this wonderful settlement with cobblestone pavements that take visitor back in time. The town of Pili pays back a visit with the site of a 17the century and a museum, along with 16the century stone bridge passing over a river. As the area has been inhabited since 3000 BC, several archaeological monuments are scattered around the area, with the most important being at Trikala town, the Asklipion Trikkis Archaeological Park. Trikala is the birthplace of the Ancient Greek god of medicine, Asklipios, using the wild medicinal plants and herbs of the area to formulate cures, where nowadays ruins of his temple remain as a kind reminder of the ancient history of the area. On the top hill of the town of Trikala, visitors can admire the Medieval Frourio, built by Emperor Justinian during the 6th century. The most popular part of the castle is the Clock Tower, the most beautiful landmark of the town, to offer a panoramic view, while nearby there is a theatre to host several performances during the summer period. 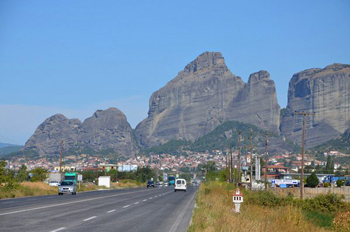 Among all, the site that makes the area of Trikala world famous is the declared UNESCO World Heritage Site of Meteora, a world unique astonishing location that awes every visitor. 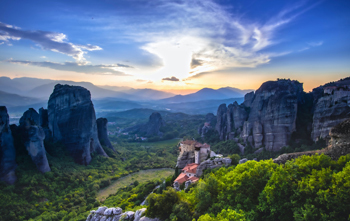 Situated above the town of Kalambaka, Meteora is a 15 million years old rare geological phenomenon with a group of massive suspended rocks of about 400 meters height. The site becomes even more impressive with the view of the rocks' tops which house impressive monasteries, built as their natural extension. These constructions that took place during the 14th and 15th century impress not only with their beauty, but also when considering the practical inconveniences of that period the constructors faced, especially due to accessibility restrains as all the building materials had to be winched up in baskets. The site is the second largest monastic and pilgrimage area in Greece after Mount Athos, where the first monks found refuge at the area during the 11th century and lived at the several small caves formed at the rocks. Nowadays access to the several monasteries is a lot easier through stone paths or special cable cars, usually used by the monks. Thousands of tourists reach for a visit at Meteora in order to feel the aura of the contemplative seclusion of monastic life, to admire the unique natural landscape and literally embrace the feeling of closeness to God. The monasteries built throughout the years reached the numberof 24, however currently only 6 of them are inhabited. The biggest monasteries are the Megalo Meteoro Monastery with an old Holy Table that operates as a museum, also at the Varlaam Monastery. Other highly visited monasteries are Roussanou, St. Nikolas Anapausa, St. Stefanos, and the less accessible Trinity Monastery. The land of Trikala is an ideal field for a number of activities as mountains, forests, rivers, canyons and caves offer for several activities. The fully equipped ski center of Pertouli is one of the most beautiful ones as slopes are hugged by a fir forest is popular among lovers of ski and snowboard. The highlands of the area offer for paragliding, horseback riding and mountain climbing while Meteora attract highly adventurous rock climbers. Several trails are marked for enjoyable hikes around the area with lush greenery where bird watchers can enjoy a wide range of protected species Aspropotamos and Tria Potamia are undoubtedly Greece's jewels, featuring imposing and spellbinding landscapes, rare wild flowers growing in abundance and a rich fir forest with River Acheloos flowing amidst them, while the local canyons at the mountainous waterfalls are of unique beauty. 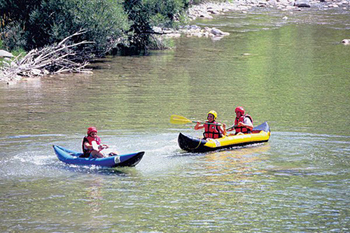 Fishing, hunting, mountain biking, trekking, air gliding, rafting and kayaking are only some of the activities that visitors can enjoy in the Pindos Mountains area. Last but not least, the city of Trikala is one of the very few cities of Greece to be highly bike friendly, thus cycling is thoroughly practiced by the locals. The fertile grounds of the Thesalian plain along with the hilly areas of the prefecture of Trikala, result to an extensive production of several local delicacies, well worth a taste, as eating and drinking is an integral part of one's visit. Trikala is pretty famous for its livestock producing high quality of meats, meat products and diary products. Fresh goat's milk, churned buttermilk, yogurt along with home made trahana and pasta are of exceptional taste while feta cheese, rustic bread baked in traditional ovens, mouth – watering meats and sausages are offered in every restaurant or tavern. Fresh local products to be found across the area are wild herbs and teas, honey, beans, local type of apples called skioupia, chestnuts, walnuts, hazelnuts, wild berries and figs. Some of the exclusively local dishes are the popular bean soup, pies with several fillings like cheese, leafy greens etc, or the local drink tsalafouti made of hot mild with salt. Finally several deserts other than the widely available spoon sweets, the local walnut bases deserts, baklai, a local version of baklava made with honey, a delicious milk pudding pastry are tasty delicacies for the sweet toothed visitors. Finally tsipouro, a pomace grape-distilled strong alcoholic drink accompanies every meal and especially the local mezes.